Temporary Credit Limit Increase: Allows providers to grant a credit limit extension to a customer for a defined period; the limit is restored to the original value after expiration. On-Demand DID Provisioning With DIDx: Online DID marketplace DIDx.net is now one of the options for automated, on-demand DID (Direct Inbound Dialing) number provisioning. Call Forwarding from IP Phones: End users can now program a “forward to” number directly into his or her phone, simplifying the migration of PBX users to IP Centrex. SMS Notifications: PortaSwitch’s customer service alert capability has been expanded from email to include SMS messages sent directly to the user’s mobile phone. New Taxation Mode for BillSoft: A new taxation mode, “switched trunk services,” will be supported with BillSoft in addition to the current mode, “non-switched trunk services.” This allows providers to perform taxation for SIP trunking services for U.S. customers. Corporate PIN-less Dialing IVR: Allows providers to deliver PIN-less dialing to enterprise customers when multiple individuals place calls using the same caller number, typically the enterprise’s main phone line. End users will enter a separate PIN so that calls are properly authorized and identified on a combined invoice. PortaOne’s integration of PortaUM into PortaSIP will result in a more unified configuration. 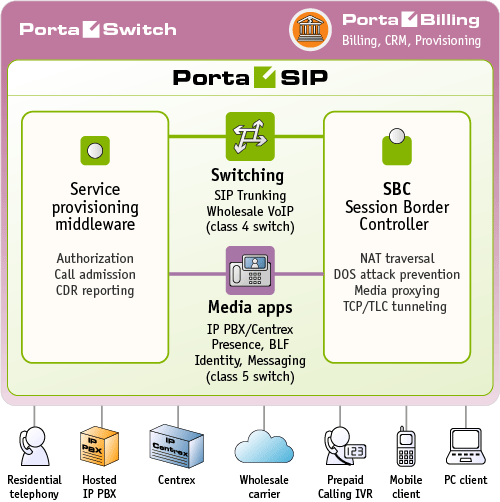 For existing customers, the only change at present will be new names for the two products: PortaUM will now be known as PortaSIP Media Server, while PortaSIP will be called PortaSIP Switching Server. Effective immediately, new customers purchasing PortaSIP will do so under a single two-server licensing arrangement wherein PortaSIP will be the main switching server and PortaUM functionality will be delivered via separate media server. Secondary licenses will be available in various options to give broader flexibility to customers based on their expansion needs. PortaOne anticipates completing its integration of PortaUM with PortaSIP within the coming year through upcoming maintenance releases. All current PortaSwitch owners whose platforms are covered by PortaOne’s PortaCare technical support program are eligible to obtain MR29. PortaOne recommends that a new release is first installed on a staging system, where you can become familiar with the new features without disrupting any production services. Users who already have a staging license can simply contact their PortaOne support team; to order a new staging license, interested users should write to sales@portaone.com.